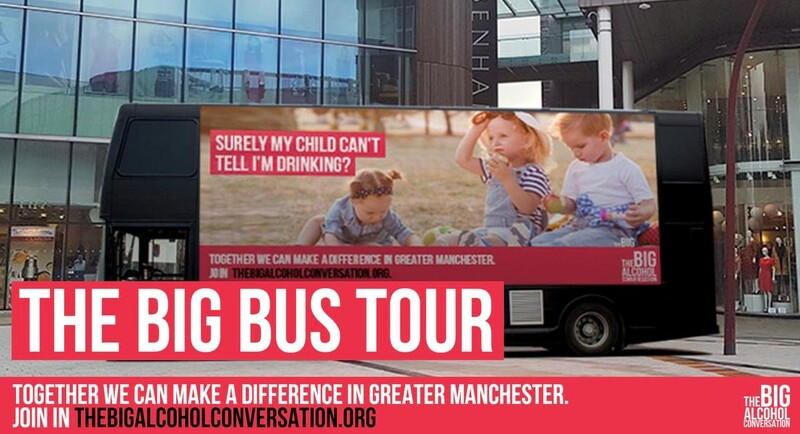 On Sunday 25th November The Big Alcohol Conversation ‘Big Bus Tour’ road show will be in Stockport. Residents are being encouraged to come along and have their say on the role of alcohol in their communities. The roadshow follows the launch of the Big Alcohol Conversation last week by Greater Manchester Mayor Andy Burnham and the Greater Manchester Health and Social Care Partnership. This revealed that harms related to alcohol are costing the city region £1.3 billion a year through health, social care, crime and work costs. This equates to almost £500 for every resident. The Big Alcohol Conversation is the largest engagement ever undertaken around alcohol harm in Greater Manchester. It is looking to gather the views of thousands of people across the city region, learning more about the role of alcohol in their lives and communities and their opinions on ways in which a safer and more responsible approach to alcohol can be secured, while supporting our close communities and vibrant nightlife to thrive. The Big Bus Tour is just one way in which Stockport residents can join in The Big Alcohol Conversation. People can also have their say by visiting www.thebigalcoholconversation.org, using #GMbigalcoholconversation on social media, or through workshops and focus-groups being run by dozens of voluntary and community groups across the city region. People who attend the Big Bus Tour have a chance to win £250 in shopping vouchers and pick up a free goody bag.